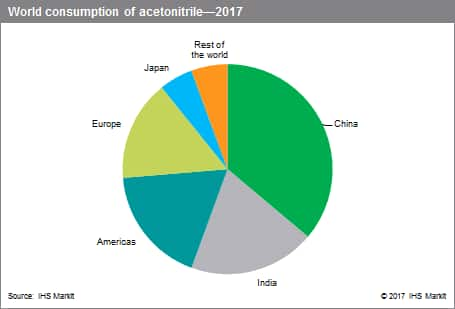 INEOS in the United States, Asahi Kasei in Japan, and CNPC Jilin Chemical Group in China are the major players in the global acetonitrile market; together, these three producers account for about 42% of global capacity in 2017. World acetonitrile consumption has continued to grow at an average annual rate of 5–6% over the last five years, thanks to the increasing production of engineered drugs, generic pharmaceuticals, and pesticides. This trend is expected to continue during 2017–22. China is currently the largest consumer, closely followed by India, the Americas, and Europe. The pharmaceutical industry is the largest end use for acetonitrile, which uses it as a reagent, reaction solvent, or extraction solvent. Acetonitrile is used as a starting material to synthesize vitamins A and B1, cortisone, carbonate drugs, and some amino acids. Moreover, acetonitrile is also used as a solvent in the production of insulin and antibiotics, including third-generation cephalosporins. The use of acetonitrile in pharmaceutical products has grown rapidly in recent years, boosted by improved living standards in industrialized countries. The second-largest use of acetonitrile is as a mobile phase in high-performance liquid chromatography (HPLC). HPLC systems have major growth prospects in the separation of chiral systems in the pharmaceutical industry. Minor uses include agricultural chemicals, butadiene extraction, and the production of intermediates. Acetonitrile is also used as a solvent in UV spectroscopy and polarography. The current acetonitrile supply situation is rather tight, because environmental issues and Hurricane Harvey have led to restricted production during the second half of 2017 in China and the United States, respectively. However, new capacity, half of which is for synthetic acetonitrile, is already planned in India and in China, and the market should become better balanced over the next couple of years. World consumption is forecast to continue to grow at about 4% per year over the next five years. The highest growth rates (about 5–7% per year) are expected for China and India, while consumption in Europe (including Switzerland), Japan, and the United States will grow slowly in 2017–22. Consumption of acetonitrile for pharmaceuticals will continue to grow during the next five years.